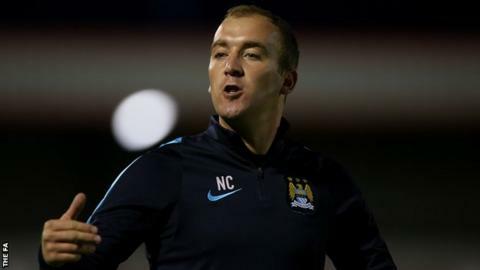 Manchester City Women boss Nick Cushing labelled the Football Association "disrespectful" over the re-arranged Continental Cup quarter-final. City lost to Arsenal on Thursday, three days after being told of the new date. The tie was re-arranged after City were cleared of fielding an ineligible player, with the FA saying it might have lost the registration form. "We're a professional football team trying to drive this game on and that's not good enough," said Cushing. "On Monday morning when we gave the players the day off, we thought we had Notts County in six days. "We play on Sunday to potentially win the league and, for certain, to grab a Champions League place. "I would have liked the respect, and to have been honoured with five or six days' preparation for that. "To put a quarter-final of a trophy, that we hold, in two days before it - personally, I think that's a little bit disrespectful." A statement on the FA website said: "It was significant in the opinion of the management committee, that whilst the registration form could not be located and had not been processed, that written confirmation from the FA, in the form of email, had been received by Manchester City Women FC." Cushing said that teams cannot win games on two days' preparation. "I really feel for the players because this wasn't their doing," he added. "They wanted this Continental Cup. It's our trophy, and we wanted to retain it, but things were taken out of our hands." Cushing's side could win the Women's Super League One title on Sunday, but must beat the Lady Magpies and hope that leaders Chelsea drop points in their final game against Sunderland. Read more on Women's Super League One title race: Chelsea or Man City?